ShumiStay did an excellent job creating the itinerary for walkers and non-walkers alike. Their guidance was reassuring and informative. Highly recommend Shumistay for your next adventure in Japan. Both the Shionomichi and Shinetsu trails took us through scenic forested mountains, with views and interesting villages along the way. They were physically rewarding and challenging enough for this fairly-fit 70y.o. The cultural aspect of staying in small hotels, eating traditional Japanese food, and soaking in hot baths was a bonus. Phil’s deep knowledge and experience of Japanese culture and history and engaging personality made a fantastic experience more memorable. There were many other memorable events and beautiful scenes over my time. Japan has such a rich craft history in textiles and ceramics and unique ancient and modern architecture. We visited serene shrines, harmonious gardens and an oriental castle. This Shumi Stay is quite unique, and I can recommend it wholeheartedly to anyone with craft and cultural interests. Kazuko and Phil are friendly, knowledgeable, considerate and thoughtful hosts. Thanks to them, my trip was an experience that I could not have had any other way. I had a really fabulous time. Thanks for organising everything so efficiently for us. Thanks to your meticulous planning, we saw much more than most people would see in twice the time, and got to places tourists wouldn’t know about. I really appreciated all the translating you did for us, and also your willingness to share your amazing knowledge about the history and culture of your amazing country. We have just returned from Japan. It was the most wonderful trip. With the organisation of Phil and the guidance of Kazuko, we saw more of the real Japan than one could hope for. We told them of our interests, and what we would like to do and see, and we were not disappointed. 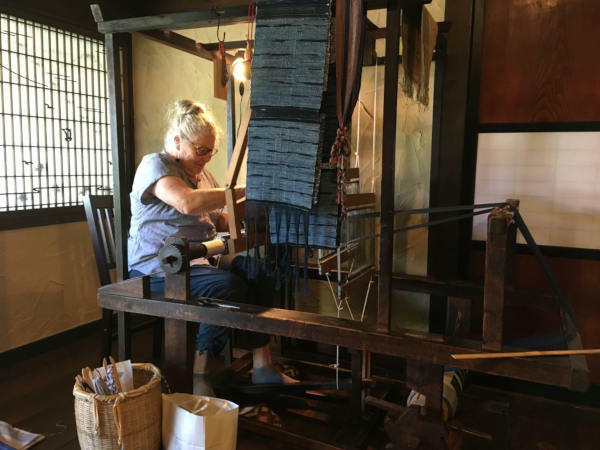 Spinning, weaving, dyeing and paper making under the tutorship of masters of their craft, were some of the things we did. They even found a wagyu beef farmer for us to talk to. They introduced us to the culinary delights of the country. We experienced the real Japan. Thank you to you both for our wonderful holiday. 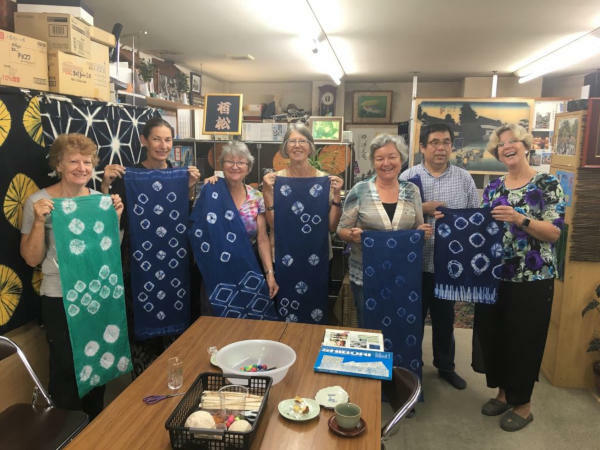 On behalf of Papermakers Qld – Lyn, Paul, Jo, Ngaire, Jan – a huge thank you Phil and Kazuko for a wonderful 2 weeks exploring traditional handmade paper techniques in Japan, we loved it! We would like to thank you both for a fantastic holiday. Thankfully we had your meticulous planning, Phil, to assist us in our wandering and also the local knowledge that both of you gave to us. The walking and sites we saw were magnificent. A beautiful part of the country which we would not have seen without your knowledge and planning. Again thank you – a truly wonderful Shumi stay. John & Mimi and Bernie & Tink from Canberra, and Nev & Bev from Brisbane, Australia. Q: I have an unusual shumi - can you cater for my shumi? A: More than likely, no matter how obscure, your shumi will be practiced in Japan. 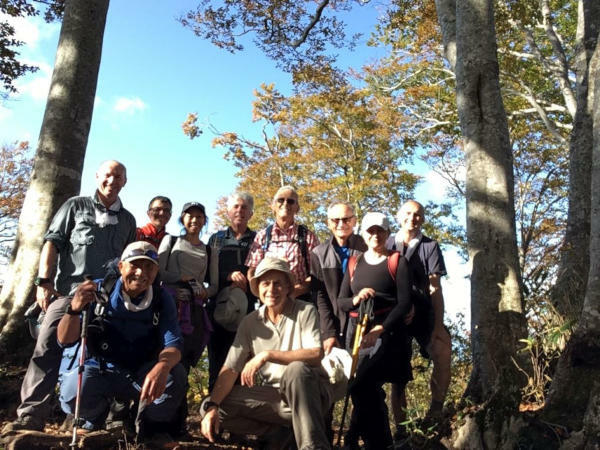 Our role at Shumi Stay Japan is to find out for you who practices your shumi and to arrange a program for your group to undertake your shumi in Japan. We will always do our best to find your shumi in Japan. All our programs are tailor-made to suit the needs of your group, but here are several examples of some programs and their approximate cost.